I really liked "Minutes to Midnight". I prefer their change of style on that album, than what they did on " A Thousand Suns". "Giving Up" is on of my favorite songs by them. That song just rocks. And like you said, I liked how Mike sang more on "Minutes to Midnight". I also liked "New Divide as well. I felt it fit right in with the sound they had going for "Minutes to Midnight". Their best album though will always be "Hybrid Theory" to me. I played that CD to death when it first came out. My all time favorite song by Linkin Park is "A Place For My Head". I love the guitar riff, and the way Chester sings in that song is awesome. Whats your favorite song by them? I went back to take a listen to some of their older stuff to try and figure out what my fave would be, and I realized that I phrased it wrong. I don't think Minutes to Midnight is a bad album at all, in fact I really like it - but not for Linkin Park. For the most part it's feels to me like a rock album that happened to have the Linkin Park guys in it...it might as well be a "Dead by Sunrise" record. They got rid of what made them unique, the DJ and synthesizer stuff, the nu-metal sound, the rapping from Mike...it was just rock. Now, it was a solid rock album, and I liked a lot of it. Like I said I liked Mike's singing (although I'd prefer him to rap) and they have a good rock sound, I just missed their unique sound. It's not that I want them to keep putting out the same stuff though, but even if they got rid of all the electronic stuff and just had a more stripped Rock/Rap album, I could see it being better for me. If I had to pick a favorite song, I'd go with either Points of Authority or Breaking the Habit...those have always been two of my faves. Although I really like Nobody's Listening too. And from Minutes to Midnight, it's either Bleed it Out or No More Sorrow. Wow. That second video and song, "Waiting For the End" gave me goosebumps. It was beautiful. I bought "Minutes to Midnight" and completely hated it. I debated on throwing away the CD. but the previous video to "Waiting for the End" is a definite no to me. I had no idea what that was. It wasn't them. Definitely not their "root" stuff. But the second song really felt like their previous work, a bit different, but at least they are trying. I'm a little uneasy on buying any more albums by them, because they have changed with their sound as well as look, immensely. They used to be individuals, adding to the band with their own individualistic sound and idea. Now it seems like they are being told what to wear and how to sound. "Oh, I don't know, maybe you should just play keyboard"
You hear that and you're like, "That guy is out of his mind"
So I feel like if they didn't end up changing them back then, before they even had one album out, and now they're one of the biggest groups of all time, I'm pretty sure they don't really get told what to do now. I feel like they're really just experimenting and trying new stuff. Which I'm kinda iffy on, because while I understand that they don't want to just basically make the same album over and over again and want to try new things, I don't always like it as much (case in point, "Minutes to Midnight"). I think they're just evolving as a group. They started in the mid-90's, and Hybrid Theory came out in 2000, and Meteora in 2003 - and when I hear anything from Hybrid Theory (and to a lesser extent Meteora) I can definitely tell it's from that era. Plus, they were all 20-something kids whereas now they're in there mid thirties, several married with kids, so it makes sense that they're not going to be doing the same stuff they did in the 90's and early 2000's 10 years later. The biggest thing for me though, why I think I like A Thousand Suns, is because I feel like while they're experimenting with other styles and ideas they are back to at least being individuals and doing what makes them unique again. They're not just doing straight rock, like Minutes to Midnight - they're using more of Mike's rapping skills and Joe's turntable/dj skills again, which makes me happy. I'm sorry to hear you don't like The Catalyst, that's one of my favorites from that album because it reminds me of Meteora. But I agree, Waiting for the End is a beautiful song - it actually reminds me of some of the stuff on Meteora, too. Yeah. I bought Fort Minor. I was young and really amped about it. I thought it was going to be promised, and I thought LP had broken up. But I know the song you listed. It's a good song. Mike has beautiful vocals, and what made me get into Linkin Park was that their sound was so unique. It wasn't another rap/rock group like Limp Bizkit (I enjoy a few selected song by them.). They were totally innovative and creative with their music. I loved it. They were angsty with a sense of class. Man.. I loved Linkin Park. I think they made me who I am today (along with a few other variables.). My first "rock" CD. I wore Hybrid Theory out. And number 3 was scratched, so to this is very day, I still haven't listened to whatever song track 3 is on Hybrid Theory, which probably sounds bizarre. I loved their songs... then Meteora was just a gift from God. I loved every track that CD had, with the varied exception of "Nobody's Listening". It's a very different song. Methinks it's the lyrics. I love the indian-esque pipe flute. I remember around the time of Minutes to Midnight, I heard rumors that their manager or was it their producer, wanted them to change their sound to more commercially-sounded music. And, ever since that album, I never really gave them a chance. I still buy their DVDs (They're mostly the golden days of touring around for Hybrid Theory. ), but I still reside a special place in my heart for them. Chester has a a lot of kids, I believe. 2? Or was it 3? He's a busy man and Mike is does a lot of solo stuff. Mr. Hahn. Haha... I remember their make-up artist likes to call Mr. Hahn, Daddy Hahn. Funny stuff. Anyone remember that album/compilation? I LOVED it. I loved it dearly. It was great. I'm not a huge fan or remixes or anything, but that album was beautiful with what those music artists did with it. I LOVE Reanimation! Such a great album...I like their Collision Course with Jay-Z too. Much like with their own stuff, they have an amazing way of mixing genres of music together and making it flow and sound so polished...it's really quite impressive. That's what I felt was lacking about Minutes to Midnight, but I never heard those rumors about the producers. I tend to assume that, like I said, since they weren't changed before their first album they probably weren't changed after they sold millions of records, but you never know. All I know is what I heard from interviews, where Chester was saying how they wanted to go to their "core" and do a straight rock album, without all of the other stuff (which makes them unique/awesome). All I remember was feeling bad for Joe and Mike, because I feel like they got kinda screwed on that album. But I do like Mike's singing voice, which is basically the only really GOOD thing that came out of Minutes to Midnight for me. I hate to say this, but I'll check out their album. I'll.... listen to it online, and if I really like it, I'll go out and buy it. I rarely accept recommendations when it comes to music! But you have me sold, sir! You dug Reanimation too? It was a great compilation album. I, man, wore it out. Had to buy another CD because it got so scratched from me just taking it everywhere. And that Waiting for the End song has been stuck in my head today. It's a great song.. I just like how Mike explodes into the song with his lyrics. Are there any songs out of the remix versions that you guys think are better than the original ? I really like the remix version of "With you" on Reanimation better than the original. They way Chester screams to open the song, and just how he sings it overall is better than the original I think. Ohh man, yes. It is. I get made fun of a lot, but this one website (it's safe, it just got a complete makeover too, looks pretty snazzy I must say.) http://hypem.com/#!/ , is a great site for remixed songs. I find a lot, not necessarily rap/hip hop songs, but a lot rock. It's where I got for majority of my songs. They accumulate songs from bloggers all over the internet. Pretty nifty. Haha, well now I REALLY hope you like it, otherwise my word will be moot from now on. But seriously, I'm interested to hear what you think. I feel like the album is more "Waiting for the End" than it is "Catalyst" like, so maybe you'll like it. Ohh man, yes. It is. I love that one, and there are a few other ones on there that I really like, the remixes of In the End, Place for My Head, One Step Closer, High Voltage and My December. Alrighty then, I'll give you a review on it then whenever I get a chance to listen to it. Recently, my iTunes found a great radio station. I literally can not stop listening to it. It's grand. I really admire the way they ended the album with "Krawling/Krwlng". It was pure symphonic and beautiful. I wish that album was more well known. I wonder why it went unnoticed to many people? Wait, iTunes can find radio stations? 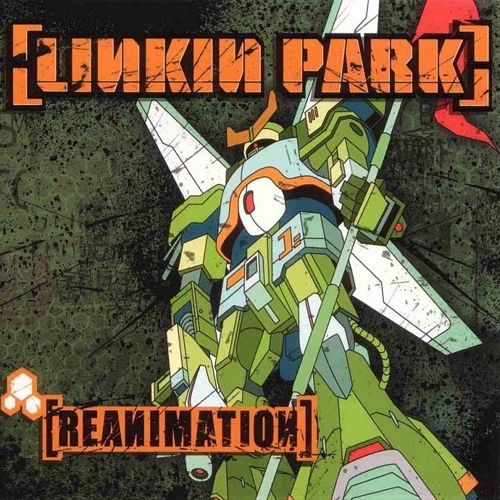 I remember a long time ago, the radio did play a track off of Reanimation, which was funny because it was a notorious pop station that played all the Brittany Spears and whatnot. I thought it was a cool, brief change. And yes! It does! To the left of your iTunes, inside that box panel where it says, "Library", "Store", "Genius", "Playlists", etc., under "Library" there is a "Radio" link, and when you click it, it gives you numerous genres, to limitless radio stations, without the fuzzy static. It's great. I've been listening to a Florida radio station for the past week. Haha! You guys have the best juice, seriously. Let me first tell you that. Ha! Nope. We have really awkward stations in my opinion. We have southern rock which I'm tired of listening to, and pop music. I'm just tired of the monotonous music. It never changes. And we have rap. Which is probably the worst thing the state of Georgia could have listened to. It's horrible..